I was thinking to make Chanachur for my daughter (it’s kinda her staple food) and I found that It will my 200th post. For 200th post chanachur will be perfect. 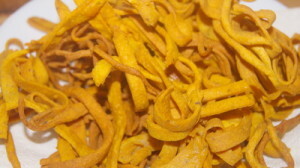 Chanachur is the most popular crispy snack in Bangladesh. 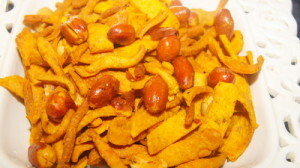 Though you can find same kind of crisp in other countries (bhuja, bhujia, soy crisp, chickpeas noodle, sev etc), Bangladeshi Chanachur has its own place for its taste and flavour. But usually we don’t make it at home. For professional chanachur making we need certain type chanachur making machine (kind of chakli maker). As usual I don’t have the machine, I take great courage to make Chanachur at home and simply love result. Hope you will love it too. Thanks all my facebook group mates for their lovely suggestions. Thanks to all readers for giving me continuous inspiration and don’t forget to like my facebook page or join my facebook group for keeping touch with me. 1. 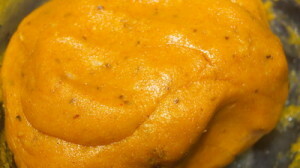 Mix chickpea flour, 2 tablespoons oil, salt, baking soda, baking powder and all spices together. 2. Add lukewarm water and make soft dough. Let the dough sets for 15 minutes. 3. Divide the dough into 5-6 balls, brush oil on each ball and roll it into thin flat bread. Cut bread into some thick slice and some thin slice. 5. Let the chick pea noodles cool down. When it comes to room temperature, break into 1”-1.5” pieces. 6. Heat the pan with 1 tablespoon oil and add peanuts and salt. 7. Fry peanuts on low heat and stir constantly. 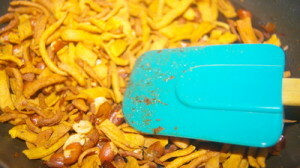 When peanut is ready, add rest of spices and noodle pieces. 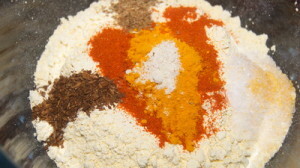 Remove from heat and stir it to mix all ingredients together. 8. Let chanachur cool down, have it or store it in airtight container. Hi amak ki miste chanachur ar upokoron gulo bola jaba plz. I am in trouble for making chanachur…can you help me? ?